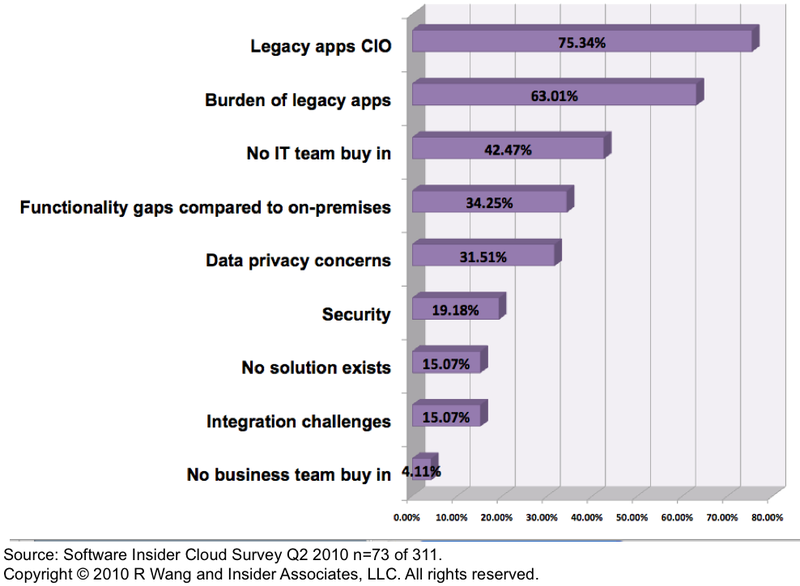 Legacy apps CIO’s. CIO’s vested in protecting the existing investments may often proceed with caution with SaaS and Cloud solutions. In some cases, sunk cost mentality takes hold and the goal of being 100% pure with a single vendor clouds the vision to meet needed business requirements. Burden of legacy apps. Legacy apps maintenance and upkeep represents a key barrier and also an enabler to SaaS and Cloud adoption. Often, the money and resources to support legacy apps consume most of the budget, leaving little funds for innovation and experimentation. Business decision makers use SaaS/Cloud to by-pass IT. No IT team buy in. Many constrained IT teams have not taken the time to understand the requirements to support SaaS and Cloud apps in a hybrid mode. SaaS requires organizations to revisit SOA strategies, integration requirements, and master data management. Business leaders and decision makers often overlook these dependencies. Point solutions. Organizations often start by augmenting gaps in existing functionality. Common areas include expense management, strategic human capital management (HCM), sales force automation, project based solutions, collaboration, and email. SaaS best of breed suites. As organizations gain comfort with the ease of use of SaaS, expect organizations to increase their preference for suites. Over time expect the best of breed “hell” scenarios to subside as SaaS vendors and integration providers rush to provide more end to end functionality or better SaaS to SaaS integration tools. Two-tier hub and spoke. Once organizations make the plunge to SaaS, the business will seek opportunities to bypass legacy apps in new environments. Two-tier deployments will emerge as organizations rush to replace legacy apps for modernization efforts, geographic considerations, and organizations with different sets of business models. Legacy containment and surround. As with legacy apps over time, organizations will seek to contain investment and surround existing apps with new capabilities. Expect core ERP apps in finance and HCM to be contained but not quickly replaced. However, failed CRM, project based solutions, and other “extended ERP” systems in vendor suites will be replaced because many vendors have not innovated quickly enough. Hosted legacy and surround. Hosted legacy and surround will emerge as a critical trend that will cut infrastructure costs for data centers and hardware. Virtualization will play a key role in reducing application management costs. Once again, the surround strategy will take hold because business can not wait for innovation from may of the legacy apps vendors.